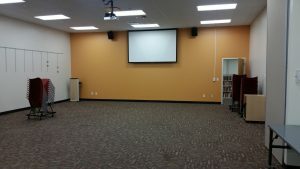 The library has several meeting rooms available to the public. The smaller meeting room is available at no charge. Reserve the room onlineopens a new window,or call 517-351-2420 to make a reservation. The larger meeting room is available for a fee. To reserve the large meeting room please read through this page and complete the form below. Fees: Two-hour minimum usage is required, one-hour increments only thereafter. If event runs beyond the scheduled time, groups will be charged for the additional hour(s). Additional time may not be available based upon the meeting room schedule. Technology Support: Groups must provide a qualified operator for any equipment used. The library can only provide limited technology support at any time. Please ask at the Reference Desk for assistance during your event. Time Reserved = The total time you will occupy the room. Meeting Time = The actual duration of your event. Please include time for setup/clean up in your Time Reserved entry. Please note: library parking is limited and other parking arrangements may be necessary. For * items, the screen side or the whole meeting room must be reserved. Coffee and tea supplies are not provided by the library. For example, would you like to use your own laptop? Will you need to broadcast sounds/music through the library's sound system? By clicking submit, I acknowledge I have read and agree to the Meeting room policy. I understand that I must report to the Service Desk before and after my meeting. I understand that I am responsible for the room and its contents.